Ask Your Dad has partnered with Tide for this column. The words, the story, and the mess are very much our own. There are very few things my kids are better at than making a mess. Duchess is getting better at reading, and Captain can count to 15 before he starts repeating himself, but when it comes to making messes both of my kids could teach a master class at Harvard. 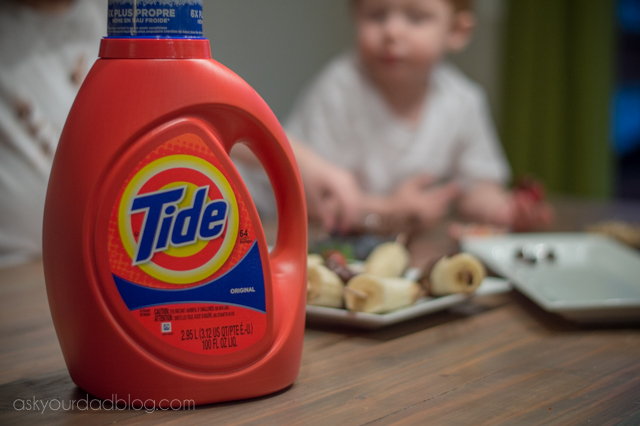 So when Tide reached out and challenged us to make a mess with our kids, I laughed a little. Oh silly Tide. You don’t know what you’re getting yourself into. I called Stevie. “Will you clean the kitchen when we’re done?” She said hesitantly. She calls me Kinnear when I am being nuts. So we tried this dessert thing out a few months ago for a post we wanted to do on Stevie’s blog, Big Awesome Mess. Despite the name of her blog, we didn’t in fact want to create a big awesome mess. We wanted to create a beautiful and easy family dessert that the kids could have fun making. Instead we created Chocolategheddon. The plan was as follows. Microwave chocolate. Buy fresh fruit. Dip a variety of fresh fruit in chocolate. Laugh. Eat. Here’s what actually happened. Captain decided he didn’t want to dip fruit in chocolate. He wanted a handful of melted chocolate. (Don’t worry, we let it cool down first.) He grabbed a hand full of lukewarm melted chocolate and my first reaction was to take it away from him… by grabbing it out of his hand. Then my hand was covered with less lukewarm chocolate, quickly hardening chocolate. Meanwhile, Duchess had dipped a banana into the chocolate and it had gotten stuck like a boot in quicksand. 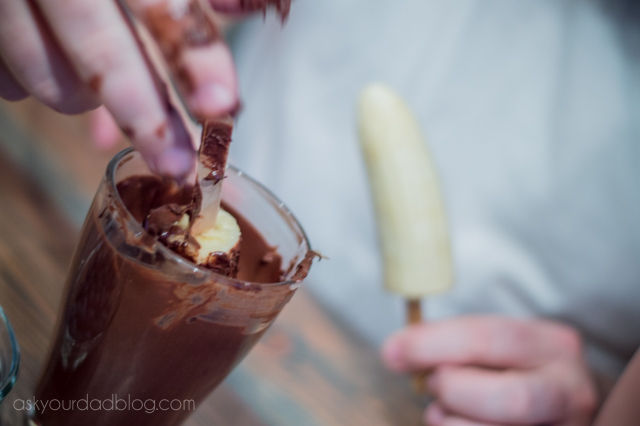 When she tried to pull it out, the Popsicle stick slide away from the inside of the banana leaving it to baste in its chocolaty grave. Duchess was having none of that. She doesn’t leave a banana behind. Converting her tiny toddler hand into a tiny claw machine, she went into the chocolate bowl to retrieve the banana. “Nooo! 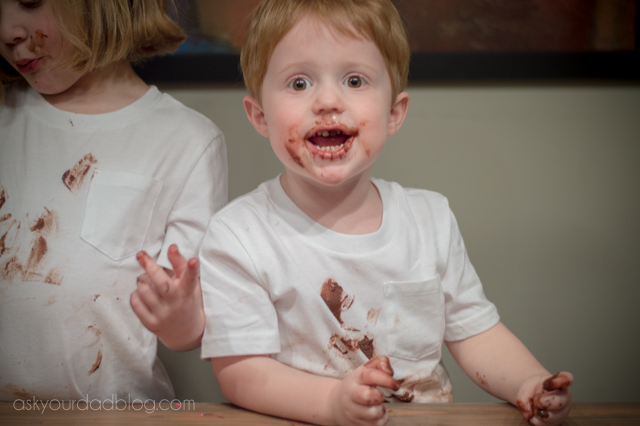 Just leave it.” I reached for her arm to keep her from going in forgetting that my hands were already covered with chocolate and transferring most of what was left onto her forearm. She was pretty excited about this and immediately began eating the chocolate off her arm. Meanwhile Captain had returned to eating fistfuls of chocolate behind me. Oh, and by the way, Stevie was on the other side of the table the whole time laughing uncontrollably. Thanks Stevie. Anyway, that is why Stevie thought I was nuts for giving it another go. 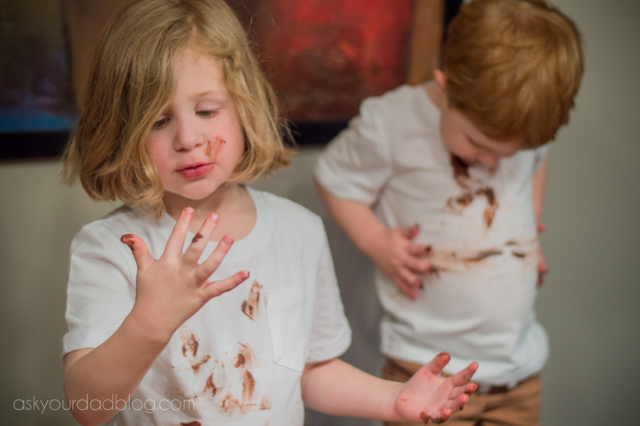 But when Tide asked us to have a little fun making a mess, chocolate disaster dessert night was all I could think of. Here’s why. One of the most vivid and fond memories I have of my childhood was when I was 5 years old, the same age Duchess is now. I spilled a glass of water at the dinner table and it flowed across the side and into my dad’s lap. I felt really bad and started apologizing and crying. I’ll never forget what happened next. My dad said “It’s just water” and took his own water and started pouring it in his own lap. Before the water was gone he moved it over and poured it in my mom’s lap. She in turn poured her water on my dad’s head and It. Was. On. The Kinnear Family Water Fight of 1986 lasted for a little over an hour. By the time it was done nothing in the kitchen was dry and everyone was laughing. I still laugh when I think about it. That’s the thing. It’s just some chocolate. Even if it did stain, my kids wouldn’t remember that. 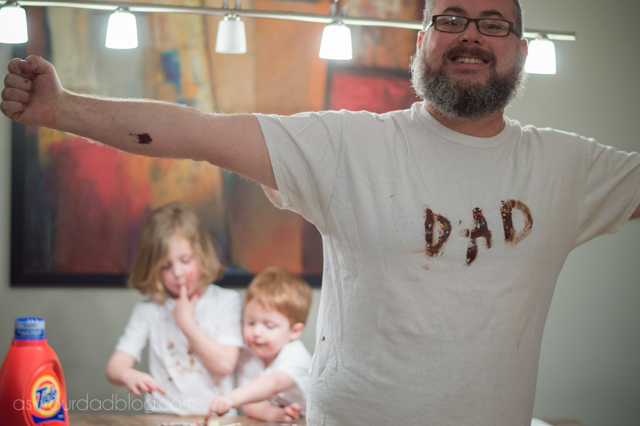 They will remember their mom laughing hysterically and me with chocolate up to my elbows. Hopefully they’ll keep that spark of spontaneity in their hearts and someday when their kids spill water or chocolate or paint they’ll be able to laugh it off and create a moment much like the one I shared with my kids, and recreated last night with great success. fine, but even if they hadn’t I wouldn’t mind. Their just clothes. It’s just chocolate. I love my little #stainmaker(s). Make sure when you’re watching the Oscars pre-show this Sunday you look out for Tide’s newest #stainmaker ad. I'm fairly sure it will be both cringe-worthy and adorable. Just like my kids! I was reading carefully in the same classification and I just run over this site which I thought that it was great. It looked fascinating and I chose to investigate each substance and I read yours. My compliment about this blog is exceptionally positive I visit this blog first time and inspire by this good stuff work. Incredible post keeps up posting such great information. If you like to travel then you can use munnar call taxi for a trust worthy travel.